Sheik Saya Al-Turi demands his rights as a citizen of Israel. Early in our trip to Israel and Palestine, I came up with an imaginary drinking game. We’d take a shot every time someone said the word “hope.” Later, I determined that we’d have better luck if the magic word were “privilege.” In any event, given our accommodations in conservative, Muslim East Jerusalem and Hebron, there wouldn’t be much drinking going on, and most of the time, I managed to keep my snarky comments to myself. Maybe it’s not surprising that after our intense time in Hebron, when our schedules allowed for a free day, I arranged for a little time alone, to decompress, to try to make contact with a relative, and to explore Jaffa. The rest of the group took a Palestinian bus to Ramallah to hang out in cafes and visit Mahmud Darwish’s grave, and I felt a little as though I were going rogue as I stepped onto extremely Israeli transportation and headed towards Tel Aviv. And here’s what kept going through my head: This is what happens when Jews have power. Political bookshop and cafe– much like the Educational Bookshop in East Jerusalem– but they had no maps of pre-48 Jaffa. Yet I’d come to Jaffa to explore a different path, in fact to try to find some hope. Jaffa is one of the cities mentioned in Menachem Klein’s Lives in Common,and his final chapter has a few paragraphs about Jaffa’s mixed communities, neighborhoods where Israeli Jews and Arabs manage to interact in ways that approach relationships of equals. 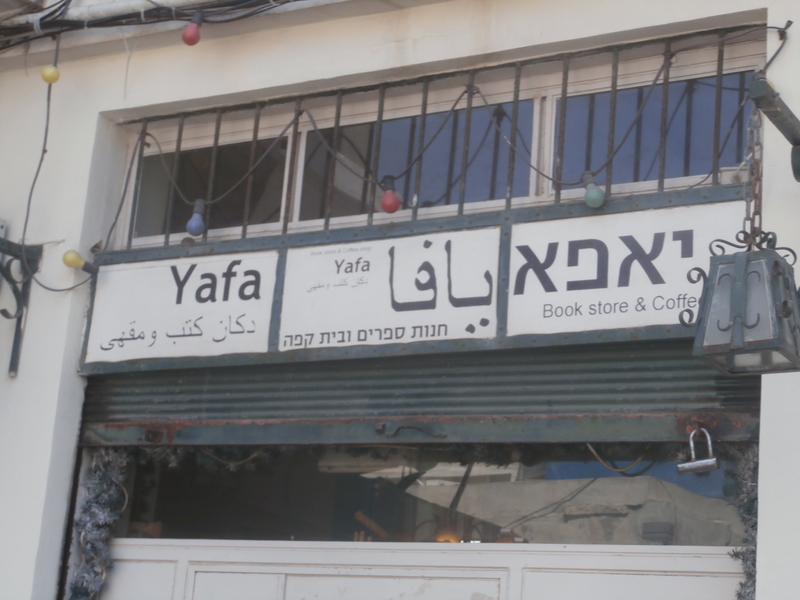 I didn’t have much more than the address of Yafa, a bookstore and cafe that Klein mentioned, and once there, I found out that an alternative tour wasn’t feasible. Eventually, I walked further south and left the Tel Aviv/Yafo insert on my map altogether, in search of an Ajami Street before I realized it was the name of a neighborhood, walking my feet raw,searching for a kind of White Whale of civil equality, an indisputable sign of a possible future. Then, I gave up, went to the beach, put on a bathing suit, and briefly let rough, warm ocean waves crash over me. If I’d gone to Ramallah, I might have seen a different possibility, a functioning city under the jurisdiction of the Palestinian Authority. My fellow delegates enjoyed mint lemon aides and cappuccinos on the top floor of the Palestine Trade Center, sampled knafeh ice cream, and got to be lazy and relaxed in a place where Israel had no jurisdiction. I regretted missing the ice cream. I also wondered if I’d missed a chance to see the PA doing something right, and to up-end my own cynicism about its role in the West Bank. Of course, this trip was not designed to make us cynical. We ought to return waving a banner that reads “Existence is Resistance!” We should celebrate incremental steps by Palestinians to make life on the ground marginally more tenable, a roof repaired in Hebron’s Old City, a greenhouse in a refugee camp, women slipping cameras past Israeli border guards by disguising them as babies wrapped in blankets, and then using those cameras to record human- rights abuses and to share those images all over the world. In these blogs, there isn’t space to name and honor every pocket of nonviolent resistance we witnessed, or every story we heard. The boys who rammed their bikes through the Saturday Hebron Settler Tours, shouting at the top of their lungs, and zooming down alleys as soon as there was the slimmest opening, their fearlessness and joy– surely that’s resistance too. However, says Jeff Halper, it’s not enough. The founder of Israeli Committee Against House Demolitions, a long-time activist with an abrasive cut-through-crap manner, he met us prior to an ICAHD tour of home demolitions in East Jerusalem. He began by saying “ICAHD is not an NGO. We’re a political organization.” He went on, without apology, to let us know what he thought of NGOs and their affect on Palestinian society. Palestine, he said, has become “NGO-ified”, domesticated by the international community, and he claims that Palestine has no real economy. Essentially, he says, NGOs and the Palestinian Authority itself deal in “conflict management.” ICHAD is interested in ending the Israeli occupation, completely and totally. Jeff Halper of Israeli Committee Against House Demolitions, with visual aid. 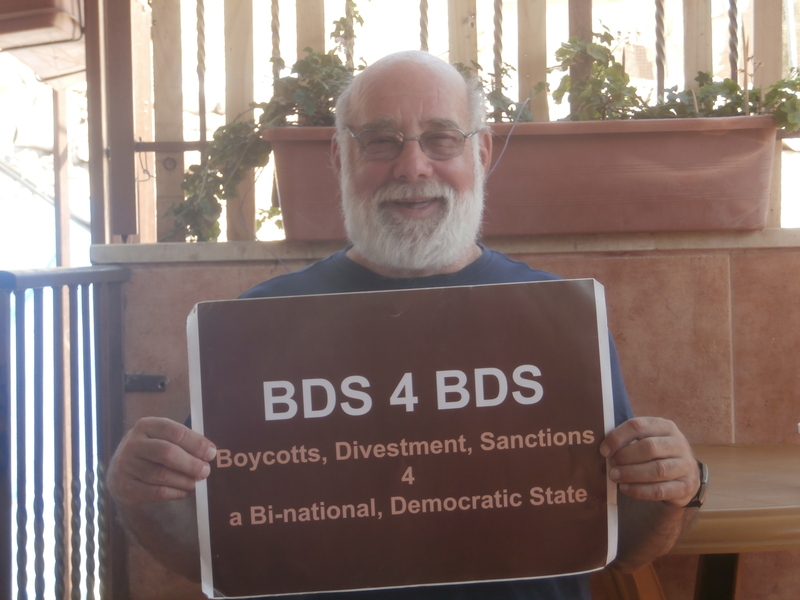 It’s easy to parody Jeff Halper, the old male leftist with his slogans and his certainty. Of course, he’s not the first to advocate for a Bi-national State. Martin Buber, the Cultural Zionist, took that position in 1925 and maintained it long after Israel was established . The Palestinian intellectual Edward Said advocated for it in an editorial in the New York Times. Yet of course, neither of these men were politicians. Jeff knows that even if it were prefaced by a Palestinian admission of defeat, Israel would never swallow this idea without a fight. Given the assumed demographic realities of a combined Israel and Palestine, Jews would soon be out-numbered. Yet Jeff has models of bi-national states, such as Belgium and Canada, and more to the point, the example of South Africa and the African National Congress Freedom Charter, which guaranteed full rights to minorities. Jeff’s words stayed with me during the last stretch of the trip which was spent with Israeli activists as guides, visiting the sites of demolished homes in East Jerusalem. Palestinians there are Israeli residents rather than citizens; citizenship would mean pledging allegiance to Israel’s symbols, and renouncing any other citizenship (a limitation not placed on Jewish citizens of Israel). The residents pay a disproportionately high share of municipal taxes while being denied many basic services, like water and trash collection. Ironies abound: Israel plans to build a tolerance museum on the ruins of a Muslim cemetery; Palestinians actually have to pay Israel to demolish their homes (they get a discount if they pay for clearing rubble in advance). Palestinians are like Jews. Stateless, haunted by a catastrophe, they carry their memories with them. In their diaspora throughout the Arab world and in Europe, they’ve proven to be part of the cosmopolitan class, stressing education and often serving as a revolutionary vanguard. They want a homeland. Palestinians are like all indigenous peoples. They have been forced off of their land, and herded into quasi-reservations where their culture is devalued, and their traditions are erased. The colonial powers insist that this is a way to bring them into the modern age and assure that women have equal rights. Palestinians are like African Americans. Subject to a distinct and unequal set of laws, attending separate and unequal schools, faced with both institutionalized and casual discrimination, they are literally invisible to Israeli Jews, and I would not be surprised if Dubois’s concept of double-consciousness applies precisely to their circumstances, particularly if they live on the Israeli side of the Green Line. Of course, all three are simultaneously true, and nowhere did they converge as fully as on our final day-trip to the Negev. 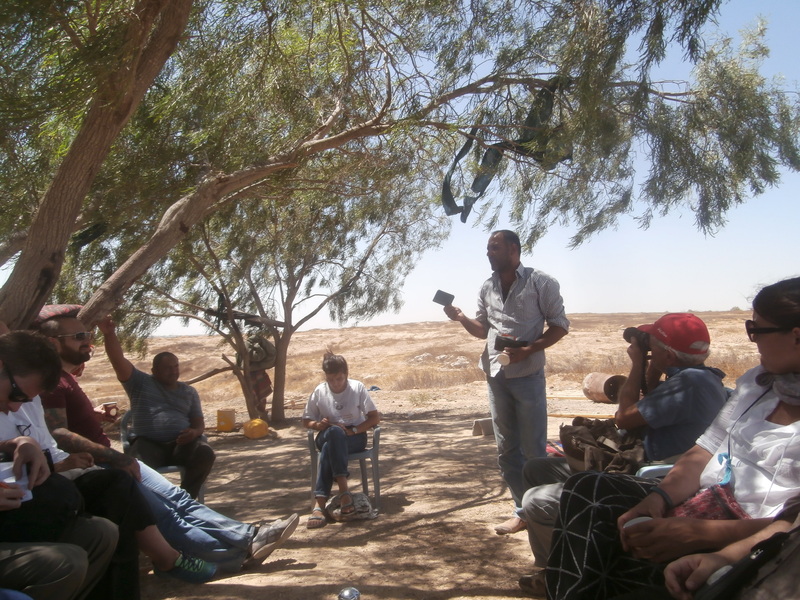 Taking a van, we scooped up Amos Gvirtz and Kessem Adiv from the Negev Coexistence Forum, and we traveled south to an area just above Beersheba, to visit unrecognized Bedouin villages. The analogy with indigenous people feels obvious. Israel assumes the Bedouins are nomads who have no fixed residence, and these romantic misconceptions make it easy for the Israeli government to literally refuse to acknowledge their villages exist. As in the West Bank, infrastructure bypasses these unrecognized communities; in one case, we saw electrical lines pass right by a village to an Israeli-Jewish ranch and dog cemetery. Everywhere was evidence of the work of the Jewish National Fund which expropriates village land deemed “uninhabitable,” and plants their famous forests, part of the Zionist ethos of “making the desert bloom”. Once their villages are leveled, the Israeli authorities solve “The Bedouin Problem” by resettling them into planned townships which– predictably– have some of the highest poverty and crime rates in Israel. With Amos and Kessem, we visited two of these unrecognized Bedouin villages.. Much of their story could just as easily have been told in the West Bank; the similarities to Susiya are striking, from the rationale for demolition– including a claim the land is uninhabitable or needed for military or “green” purposes– to the residents’ defiant commitment to traditional culture, including being gracious hosts.. The village secretaries brought our delegation tiny cups of coffee, followed by tea and sweets. Yet there are noteworthy distinctions. The Bedouins spoke Hebrew. And they spoke– without question– as Israeli citizens. 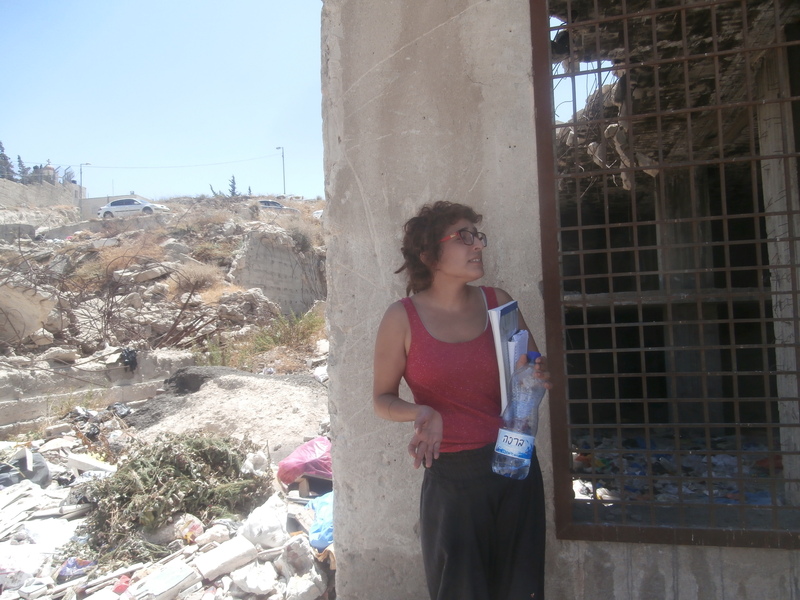 In Um El Haran, the village secretary Rael described the Israeli military’s seizure of the original site in 1949. Residents were told they could return in six months, but eventually they were transferred to another area. In 1963,, much of the new village’s agricultural land was confiscated to plant a JNF forest, one of the biggest in Israel. Their village chief cooperated with the planting, having been told it would create jobs for the village and their sheep could graze among the trees. However, once it was planted, no villager could enter. In 2004, Um El Haran received its first demolition order; the Israeli government intends to resettle the population in one of the planned towns and to create a Jewish village called Haran to take its place. Rael proposed several compromises, one of which was to create a mixed village– Jewish and Arab– where they could live together on this land as citizens of Israel. 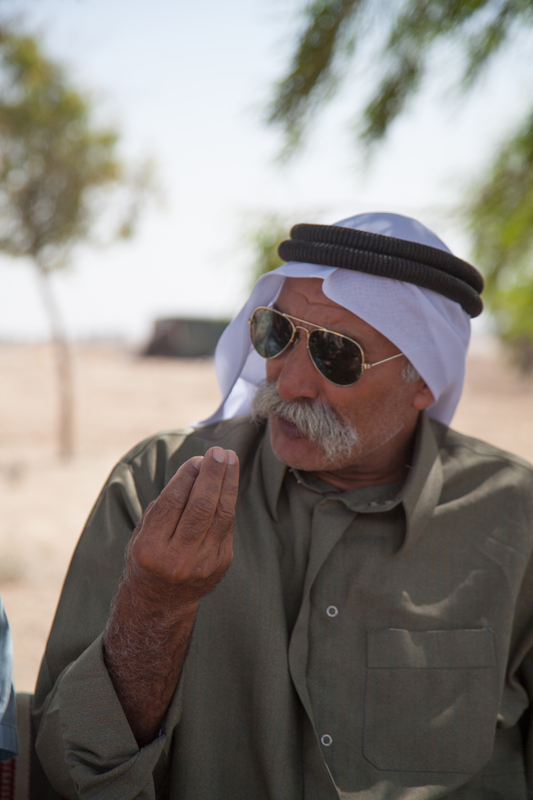 Azziz Al-Turi holds up his Israeli ID card two days after his villages was demolished. Clothing was stored on trees. The anger and urgency felt far stronger in Ara Kid, settled by the Alturi tribe; their land, too, has been claimed by the JNF which uprooted the village’s crops and planted its own forest. We arrived only two days after the latest demolition; residents’ clothing was still in trees among rough tents. All told, the village had been demolished over seventy times, and villagers wait in their ancestral cemetery when bulldozers come so the Israeli army won’t evict them. Aziz al-Turi and his father, Sheikh Saya Al-Turi were both furious. Aziz waved his Israeli identity card. They both described the JNF and Prime Minister Netanyahu as terrorists. The Sheik in particular spoke at length, as the young Israeli woman Kessem translated. For me, at the moment, something happened. My dormant Hebrew came back to me. The Sheik’s slow voice, his adamantly clear pronunciation, made no translation necessary. We were all hot and tired, and it seemed that Sheikh Saya Al-Turi would never finish, yet there was something breathtaking about hearing this angry village elder rail against Israel not as an occupying power, but as his own country. Back on our tour-bus, Amos– an old Israeli activist like Jeff Halper– talked about geopolitics, and, with some prompting, about his own political trajectory. Amos was born on a kibbutz, but somewhere along the line became a pacifist and joined an international chapter of the War Resister’s League which included Israelis and Palestinians. He was part of ICHAD, and fought the increase in Palestinian house demolitions which Israel implemented after the Oslo agreement to appease the Right. When he saw the first home being demolished, Amos said, he became an anti-Zionist. Then, during the outbreak of the Second Intifada in 2000, Amos said, Palestinian groups declared a united front which meant that they could no longer work with Israeli allies like ICAHD. It was around this time he felt called to work in partnership with Arab citizens of Israel. I’ve read your posts on the delegation with great interest. With this one, you stopped me when I read the line “the legacy of our treatment of indigenous people.” The genocidal treatment of indigenous people is not part of our history — it’s ongoing. Much like the Nakba didn’t stop in 1948 — the Zionist attempt to erase Palestinians continues every day. Whether you call it white supremacy, colonialism, or ethnic cleansing, it’s not primarily an issue of discrimination or self-defeating policies in either case — but an array of kinds of violence with the intent of changing the population of each territory. You write feelingly about your encounter with Palestine/Israel — but I’m not sure you have taken the measure of the violence in which we are all complicit every day. Thanks for your thoughtful comments, Rachael. Certainly what I witnessed on both sides of the Green Line in Israel and Palestine bears out what you say there, and in some ways it may present a kind of magnifying mirror for Americans like myself and help us think harder about what’s going on around us right now. This is a truly thought-provoking series of essays. Thanks for sharing it. It is refreshing to read a nuanced view, rather than one that takes a particular side and fails to recognize the others. The civil rights movement analogy seems very apt. This series moved me, enraged me a few times, impressed me overall, and left me feeling quite ill-at-ease and confused about where to go from here (To avoid misunderstanding, let me clarify that I’m speaking here of where to go mentally and emotionally, not of some political solution or action). — I had never been an ideological Zionist, but accepted and in many ways welcomed the existence of a Jewish community / state in Israel and I hoped for the eventual establishment of a Palestinian state side-by-side with it. But after reading you, I just don’t know what to think. Very troubling. I can see why the word “hope” was not the most common among the partiipants. Thanks, Shimke. Your comments both touch me and sadden me. My pieces are beginning to be posted on Jewish Currents where many readers know a lot about Zionism and the region’s history, and I’ll be curious to see what they make of where I go with them. I’m a writer– primarily of fiction– who tries to specialize in raising uncomfortable questions (at least that’s my intention) rather than providing answers. I also welcome, deeply, the existence of a Jewish community in Israel, including the revival of the Hebrew language and the opportunity to essentially find out what happens when Jews return to a place where we aren’t guests on borrowed time. The trouble for me has always been the equation of a Jewish state which, de-facto, has to have a Jewish majority that has to be enforced in various ways that aren’t in line with what I think of as Jewish values. The reason I called my last piece “Hope” was the Negev Bedouin waving his Israeli identity card– essentially a Palestinian identifying as an Israeli and claiming rights as such. Of course, granting full civil rights raises a host of other questions, including the rights of what would become a Jewish minority. But to my mind, those feel like the right questions to wrestle with, at least right now.